Heckenast started on the pole for the 50-lap Craftsman Club Feature with Tyler Erb on the outside of the front row. Sheppard quickly jumped past Erb for second while Heckenast opened a slim advantage out front. The gap closed as Heckenast worked into traffic on lap seven and Sheppard began to size up his move.Sheppard capitalized on an opportunity to dart past Heckenast amongst a group of slower traffic in turn one and on lap 10 took over the point. Before Sheppard could gain any advantage, the first caution of the race waved before lap 11 was complete when Andy Mayhew spun in turn one. The ensuing restart did not produce a completed lap as Chub Frank slowed in corner four with a flat tire on his No.1*. The second attempt at a lap 11 restart saw Rick Eckert and Charlie Sandercock of Trenton, Ontario, Canada race past Heckenast for second and third, respectively. Heckenast retook third on lap 18, two laps before the third yellow of the race when Morgan Bagley came to a stop in turn four with a flat tire.On the restart, Sandercock and Devin Moran raced past Heckenast and challenged Eckert for second. The race was slowed though on lap 23 when Greg Oakes and Robbie Wilson tangled and spun in turn four after a chain reaction of cars braking in front of them. Sandercock used the next restart to get by Eckert and take second in the outside lane and briefly challenged Sheppard for second before engine issues for Chris Madden ended his night and brought a caution on lap 26.Moran, Erb and Eckert all drove past Sandercock on the restart while Bagley began his methodical move through the field after pitting to change a flat tire on lap 20.“It took a while to find a good line,” Erb said. “Once the No.57 car (of Sandercock) passed us up top, I figured I’d give it a shot. I just didn’t want to be the first one to go out there. Luckily we got on the top on the last restart and were able to run the top and then protect down there.”Sheppard grew his lead to 2.16 seconds over Erb with 20 laps to go and pulled away further over the next five laps while Erb and Morran battled each other for second amongst the lapped traffic. 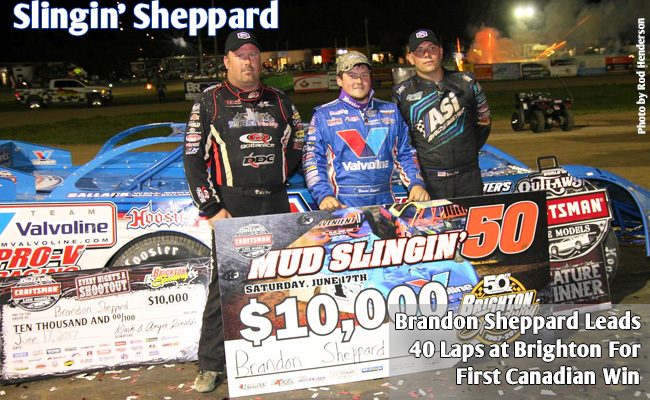 Erb came away with the second spot, but only after Sheppard had extended his lead to a full straightaway. With 10 laps to go, Bagley raced past Moran for third, but wasn’t in position to get past Erb for second.Sheppard had completely checked out in front of the field with five laps to go, leading by nearly a half lap with a gap of 5.9 seconds over Erb. The Illinois native cruised to the victory for the sixth time this year.“All of the guys were on the sidelines keeping me pumped up, telling me to keep my elbows up,” Sheppard said when asked about his late-race lead. “I just kept digging.”Texans Erb and Bagley rounded out the podium while Moran and Eckert completed the top-five.“We were pretty good, but I don’t think we had much for Brandon,” Erb said. “He’s definitely been the class of the field, but it’s been an honor running with these all guys. Hopefully we can win one of these things after all of these seconds.”Bagley’s car came alive following his lap 20 difficulties and allowed him to race to the front of the field. The third-place result was Bagley’s best finish of the season and his second top-five result of the year.“We’ve been struggling all year and just getting stuff back to where we need to be,” said a relieved Bagley in Victory Lane. “We’ve been making some gains here the last couple of weeks. It’s just coming together. We still have a lot of work to do.”The World of Outlaws Craftsman Late Model Series continues it’s northern swing at Cornwall Motor Speedway on Sunday, June 18. 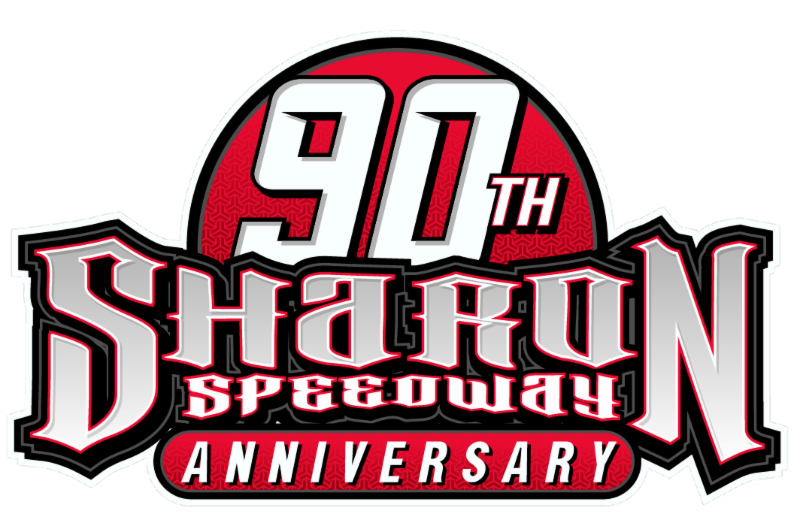 Additional Race Notes: Sheppard was quickest in time trials with a lap of 13.443 seconds, the 11th fast time award of his World of Outlaws career. Chub Frank claimed the 63rd heat race win of his career, which ranks him ninth on the Series’ all-time list. Shane Clanton was forced to a back-up car after experiencing engine issues in Hot Laps. Craftsman Club Feature (50 Laps): 1. 1-Brandon Sheppard ; 2. 91-Tyler Erb ; 3. 14m-Morgan Bagley ; 4. 9-Devin Moran ; 5. 7-Rick Eckert ; 6. 1*-Chub Frank ; 7. 57-Charlie Sandercock ; 8. 99jr-Frank Heckenast Jr. ; 9. 25-Shane Clanton ; 10. 2c-Joey Coulter ; 11. 18-Eric Wells ; 12. 29-Phil Potts ; 13. 12-Kyle Sopaz ; 14. 46-Brandon Mowat ; 15. 5-Steve Baldwin ; 16. 92-Adam Turner ; 17. 09-Robbie Wilson ; 18. 77-Caley Weese ; 19. 20-Terry Hunt ; 20. 7c-Brent Colby ; 21.10-Elmer Stevenson ; 22. 44-Chris Madden ; 23. 22-Greg Oakes ; 24. 22jr-Michael Oakes ; 25. 1020x-Andy Mayhew . For complete results from the World of Outlaws Craftsman Late Model Series event at Brighton Speedway visit the results page.